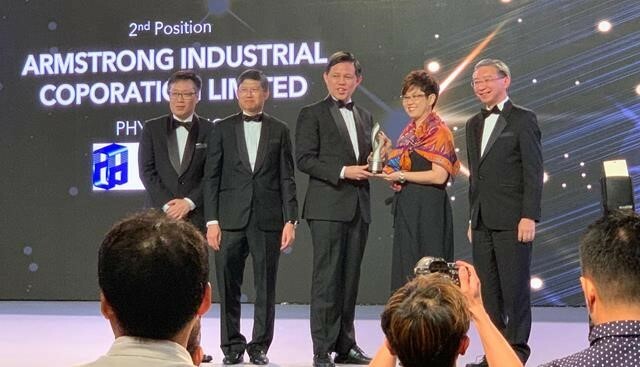 Armstrong Asia made its debut appearance at Enterprise Singapore’s prestigious E50 Awards, placing 1st Runner-Up out of 50 in a ranking of local privately owned Small Medium Enterprises (SMEs). Organised by KPMG & The Business Times & sponsored by OCBC, the gathering took place at Resorts World Singapore, and hosted over 1,000 attendees. The theme of the event was Accelerating Growth, Innovating for Tomorrow. Companies that were considered for the Top 50 have contributed to accelerating the growth at home in Singapore & abroad, as well as showing potential to innovate for the future. Guest of Honour, Mr. Chan Chun Sing (Minister for Trade and Industry), gave as simple yet sentimental presentation regarding the progress of Singapore’s growth over the last 50 years. From the founding of the nation to the present day, he concluded that Singapore is a prime example of what a hardworking and innovative population can achieve while working together, without the benefit of having any natural resources. Joining Mr. Chan Chun Sing on stage to present the awards to recipients, Mr. Wong Wei Kong of The Business Times, Mr. Ong Pang Thye of KPMG, and Mr. Linus Goh of OCBC Bank. Mr. Gilbert Ong & Ms. Phyllis Ong would like to thank all employees of Armstrong Asia for working together to be nationally recognised for their commitment to growth and innovation.